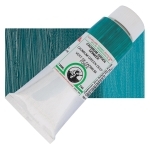 Zinc Green is commonly known as Zinc Yellow, and is alternately named PY36. It is a greenish yellow pigment. Zinc chromate is considered permanent. Zinc chromate is highly toxic. It is rarely used in art materials. Zinc chromate is commonly used to treat aluminum alloys and steel against corrosion.